The Royal Enfield Himalayan was launched a year ago, and ever since has gained a lot of popularity in the market. 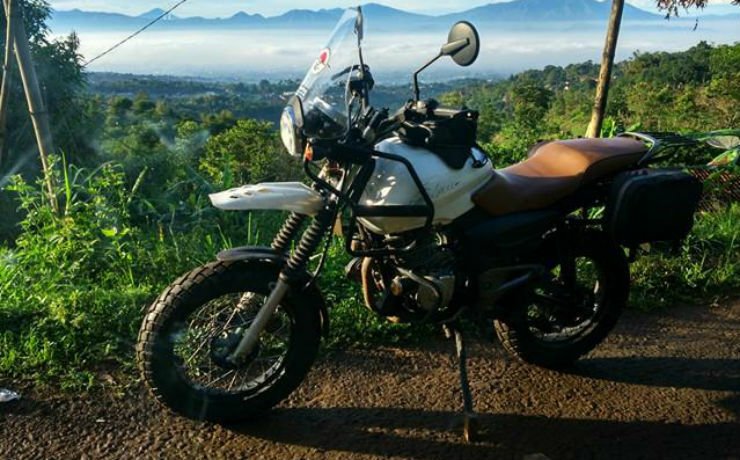 The Himalayan has also been launched in many international markets, including Indonesia. But what do you do when you have a Bajaj Pulsar, but you want the practicality of Royal Enfield Himalayan? Here’s an interesting conversion. 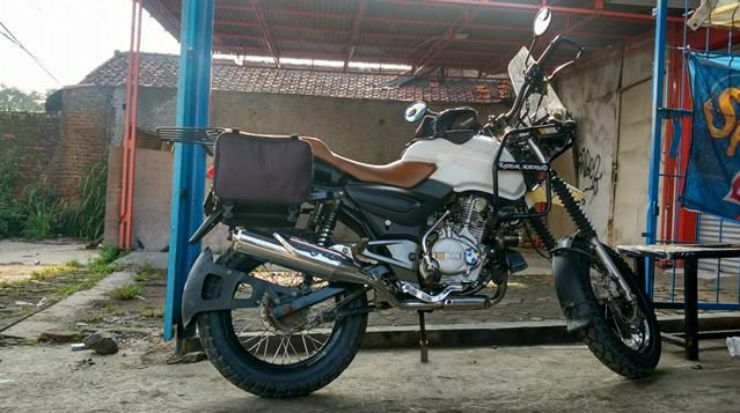 This is a Bajaj Pulsar 150 UG2 transformed into Royal Enfield Himalayan with good looking modifications. The Pulsar tank has been painted white to give it a similar colour scheme like the Himalayan. The headlamp unit of the Pulsar has been replaced with the Himalayan and LED lamps have been added to it. The tank protector/jerry can holder has been carried from the Himalayan too. To spice up the looks, the Pulsar also gets off-road front mud guard. The seat cover has been updated too. The Pulsar also receives off-road specification tyres with spoke wheels at the front and rear. At the rear, the motorcycle gets an iron rack to tie bags. There are two saddle bags, one of each side for carrying luggage during long trips. The rear of the motorcycle also gets new tail-lamp set-up. The front and rear shock absorbers and disc brakes look stock. To save money, to make the bike look unique and to make it touring friendly. Meanwhile, this is a great way of transforming an old motorcycle to adventure bike. 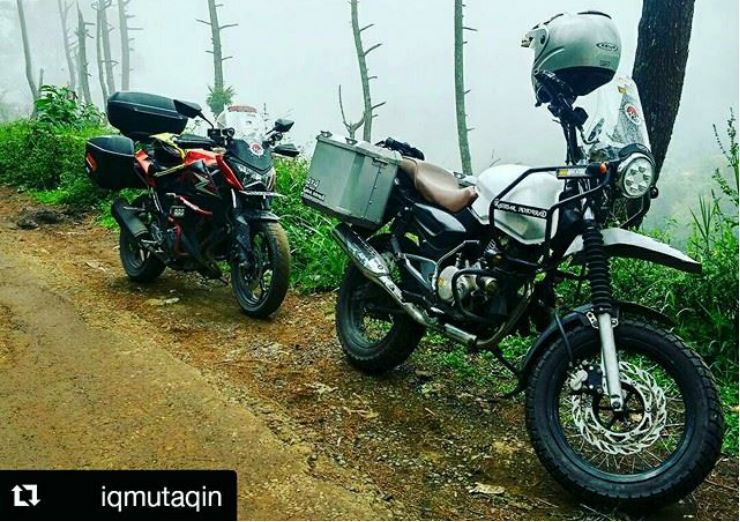 The Royal Enfield Himalayan is off-road friendly while the Pulsar isn’t. The modder has exploited the good, old reliable Pulsar plus its reliability and the Himalayan’s long distance friendly demeanor, to build a hybrid bike that’s touring friendly. 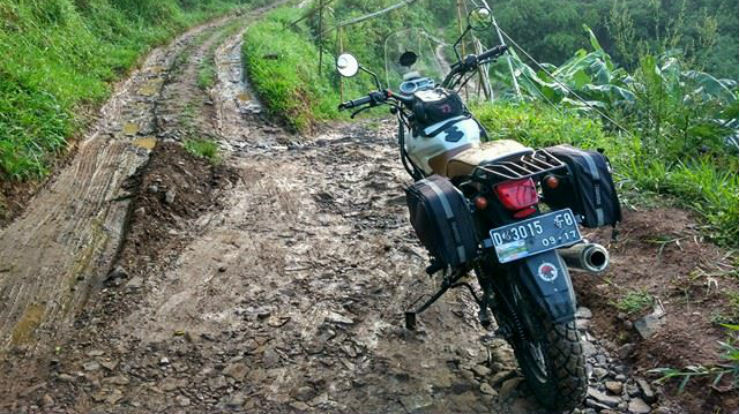 The modification provides easy access to an off-road capable motorcycle at minimal cost. Maybe Bajaj can look at the example and take some inspiration to create some new affordable product in the market. The Bajaj Pulsar 150 UG2 is powered by a 13 BHP single-cylinder engine while the Himalayan is powered by 24.5 BHP single-cylinder engine. Both bikes sell in the Indian market at vastly different price tags. The Pulsar costs less than 80,000 rupees, while the Himalayan is priced at more than double, at about 1.6 lakhs.